Nearly 120 years later, the Salt Lake City Bicycle Collective (2312 S. West Temple, 801-328-2453, BicycleCollective.org) is carrying the emancipatory tradition of the bicycle forward with its weekly Women’s Night and Queer/Trans/Femme Safe Space. Wednesday nights from 5:30 to 9 at the shop are for women and female-identifying individuals to work on their bikes, put in volunteer hours at the collective or catch a short tutorial by shop manager Meara McClenahan. McClenahan says that the nights have been seeing a steady turnout, which is partly why they’ve expanded from the first and third Wednesday of each month to weekly. On a cold Wednesday night in February, four of the shop’s six benches are occupied. Bikes are hoisted aloft, with cyclists gathering in small groups to inspect brackets and axles. A quiet samba on the radio keeps the beat between spinning wheels and shouts of joy or frustration. Alexis Smith lets out an earnest cheer after successfully adjusting her brakes. She’s a relative newcomer to Women’s Night after being invited by collective volunteer Tegan Feudale. “I figured it would be easier than going any other day because it’s a bit less intimidating,” Smith says. Catharine Scott is brushing up on the skills she’s learning at the collective’s Park Tool School Bicycle Mechanics classes. For her, Wednesday night is a “logical extension” of the Monday night classes; it fits her schedule and is a smaller, pressure-free environment to practice the week’s lessons. Volunteer Britton Hatch agrees that part of the attraction of Wednesday nights is that they’re calmer—with fewer people and more free space—than the open-shop nights on Tuesday and Thursday. There are also informal lessons on Wednesday nights hosted by McClenahan. “My idea,” she says, “is to try to and isolate one aspect of fixing bicycles that can be taught quickly.” This evening, she teaches the participants how to use sealant inside tires to prevent flats. Crystal Loya shows up with her bike in pieces. Her bike is her main mode of transportation, since parking downtown is expensive and inconvenient. 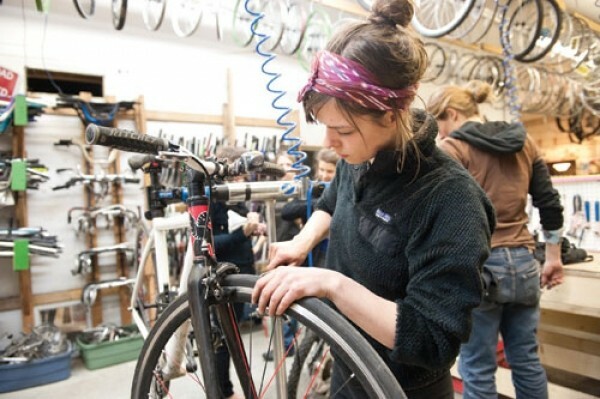 Until recently, she was relying on the men in her life for bike repairs, but she’s using her first-ever Women’s Night to strike out on her own. “The boys are done with helping me fix my bike,” she laughs. People drift in and out throughout the night, but a sense of serenity and camaraderie remains constant. A few unwitting men come to the door but are politely rebuffed and invited back for the following night’s open shop. The volunteers are quick to add that their appointed night isn’t meant to exclude their cyclist brethren. Instead, they’re trying to make a little more space for female cyclists to jump in without feeling alone or intimidated.